The Buenos Aires 2018 Youth Olympic Games moves ever closer, continental tournaments are gradually being completed and preparations in the Argentine capital city are moving towards the latter stages. Not only are players and coaches preparing for the event which commences on Saturday 6th October and concludes on Thursday 18th October; in addition umpires are also moving through the stages of selection. An integral part of the lead up to the Games is the Young Umpires Project; one member of the course which determined selection for the Nanjing 2014 Youth Olympic Games was Malaysia’s Elaine Lim Ee Lian. What were you expectations before entering the course? I came across the Young Umpires Project in 2009, when I was 20 years old. I was not selected for the first Youth Olympic Games in 2010 in Singapore. However, this did not discourage me. It inspired me to improve further. One of my favourite quotes of all time is “that which does not kill us makes us stronger.” I believe that every bad situation is an opportunity for growth. After I failed at the first attempt, I had a strong determination to be a good official and climb to the top. Afterwards, I was actively involved in umpiring in several local and international events. I was truly grateful, I received support and opportunities from my national association, the Table Tennis Association of Malaysia as well as guidance from my umpiring mentor, Cyril Sen. I became an international umpire in 2010 when I was 21 years old and I did my Advanced Umpire Training at the 2013 Japan Open in Yokohama when I was 24 years old. Hence, I was a Blue Badge in progress candidate when I applied for the Young Umpires Project again in 2013. I felt I was more prepared this time. I was selected for the Nanjing 2014 Youth Olympic Games. What was your experience at the Nanjing 2014 Youth Olympic Games? It started with an online application in 2013. The selected candidates were enrolled on the ITTF online education programme; this programme comprised a series of online education modules and extensive discussions in a URC supervised forum to which all candidates had to participate. At the end of the learning programme, we had to take an online examination to evaluate our understanding of the laws and regulations of table tennis. I was very lucky to be selected as one of the 12 foreign umpires who served at the Second Youth Olympic Games in Nanjing, China in 2014. It was a fantastic and memorable experience for me. Working with a group of young umpires who came from different parts of the world but who shared a mutual interest and passion for table tennis. It was an amazing experience for me. It connected us and enhanced our friendship among our fellow umpire colleagues. By participating in the Young Umpires Project and officiating in the Youth Olympic Games, it improved my self-confidence and increased my interest and spirit in a table tennis umpiring career. Selected to officiate in the Mixed Team Gold Medal match in the Youth Olympic Games 2014 with my partner Kerstin Duchatz from Germany, we both were encouraging each other along the umpiring journey. After we became good friends despite of long distance. Did the Young Umpires Project accelerate your career? Yes, as an “express highway”; being able to learn from very experienced course conductors like Germany’s Michael Geiger and Scotland’s Jonathan Whitaker, as well as the interactive sharing among umpire friends from different countries, we learned and improved together. What was next after the Nanjing 2014 Youth Olympic Games? I became Blue Badge International Umpire in the same year. I was selected as an umpire at the Wisdom 2014 World Junior Table Tennis Championships in Shanghai, China and the 2015 World Junior Table Tennis Championships in Vendée, France. 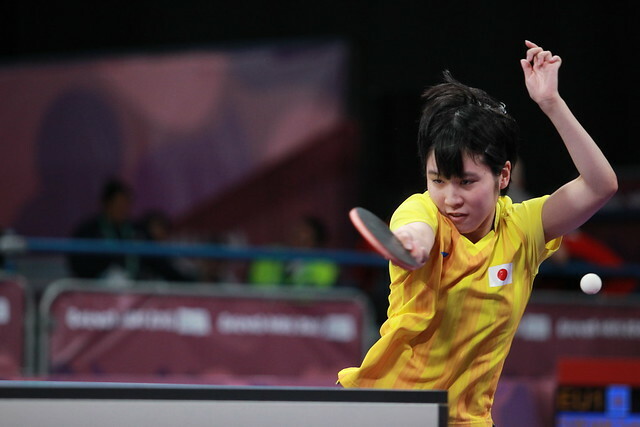 What was more exciting was umpiring in the final for the Women’s Team event between China and Japan at the 2016 World Table Tennis Championships which were held in Malaysian capital city of Kuala Lumpur. I vividly remember the remarkable atmosphere from the crowd in the stadium as they gave vocal support to the favourite players. Being a Blue Badge umpire, it provided me the opportunity to travel to different parts of world for umpiring assignments. Each trip gives me different experiences and lessons. Delayed flights, missing luggage and other incidents when travelling, have taught me to stay calm and to try to face the challenges in life which are out of our control much of the time. I will continue to voluntarily serve table tennis and I hope that one day in future, I will, in return, be able to contribute to the development of the younger generation. This I hope to do by being a course conductor, sharing my knowledge and experiences with all the young and not so young aspiring umpires. Young or senior, male or female, table tennis is for all. What would you advice be to those preparing for the Buenos Aires 2018 Youth Olympic Games? If you are looking for a platform to enhance your umpiring skills in table tennis and wish to be excel in table tennis officiating, the ITTF Young Umpires Programme is definitely be the right place for you. I am looking forward to seeing you in this big family of table tennis.